Our 16th century style oak panelled tester bed, shown here in the 'Shakespeare Room' of our clients prestigious small hotel, in the Dupont Circle area of Washington DC. This photo was kindly sent to us by the owner, who sadly has had to close the 'Artists Inn Residence', for health reasons. 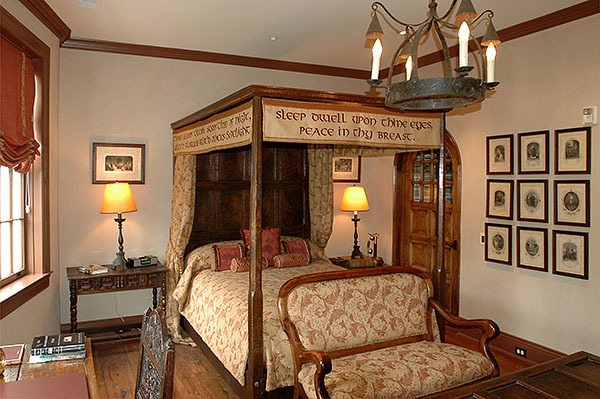 There was an article about this a couple of years ago, which featured the room in which our bed was installed: The Shakespeare Room features a Tudor-style bed, handmade in England for the Inn (opens in a new window/tab). The inscription on the cornice hangings, is taken from one of Shakespeare's plays, Romeo and Juliet. 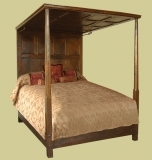 You can also see another of our clients photos here: Furnished oak panelled bed four poster bed in historic house.